Dirt Late Model Fuel Cell, ED-LM - Free Shipping For Online Orders Over $25! 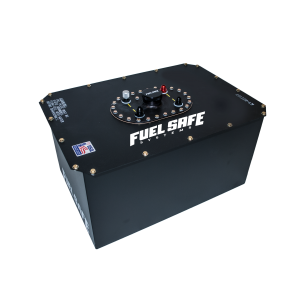 Fuel Safe's Dirt Late Model cells features our Enduro molded bladder, housed in a 20 gauge steel container with a black powder coated finish that conforms to all major sanctioning body’s rules book. A lightweight aluminum fill plate with a threaded aluminum fill cap provides excellent roll over protection. Dirt Late Model cells are available in 15, 22 (Pictured), 25, and 32 gallon configurations. ED115-LM 15 gal Enduro bladder Cell - Late Model Style 17.875" x 26" x 9.50"
ED122B-LM 22 gal Enduro bladder Cell - Late Model Style 17.125" x 25.5" x 13.75"
ED125-LM 25 gal Enduro bladder Cell- Late Model Style 17.875" x 26.25" x 14.5"
32 gal Enduro bladder Cell- Late Model Style 17.75" x 26.25" x 18.5"